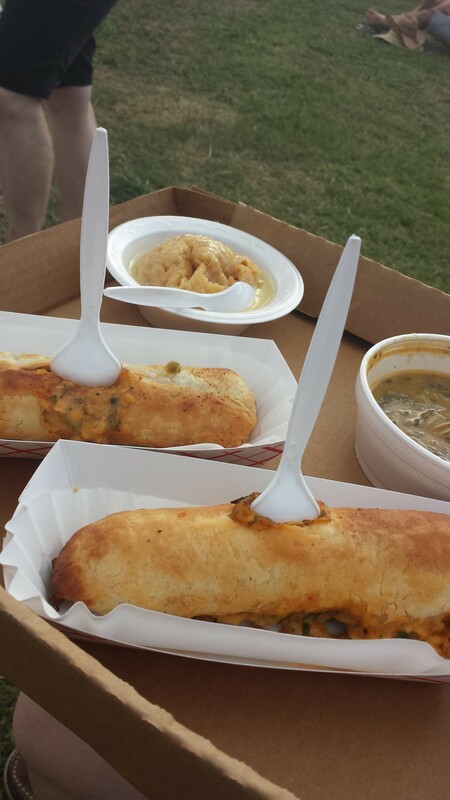 There are over 65 food booths at the New Orleans Jazz and Heritage Festival; it can make it hard to decide what to eat. 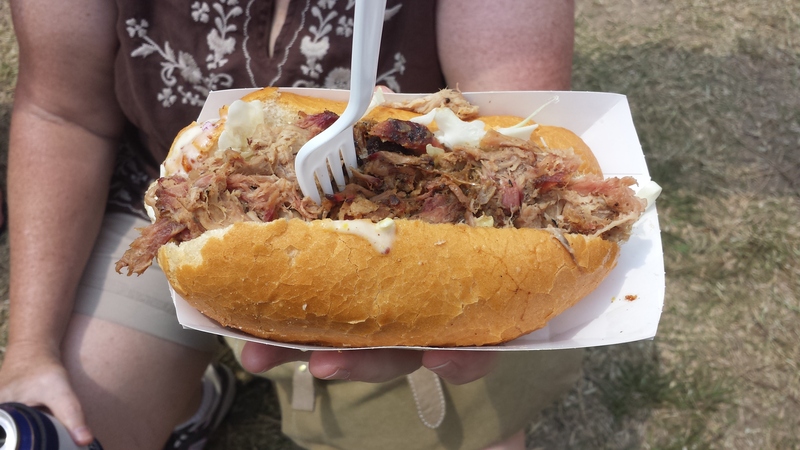 As the staff of our New Orleans Bed and Breakfast attend and sample the food booths every year, we are sharing our Top 5 Jazz Fest Food selections with photos taken from last weekend’s feasting. 1. Cochon de Lait Po-Boy from Love at First Bite Caterers. (See photo above) A must have item at least once per weekend!! While the main ingredient of this po-boy is the pork (cochon is roasted suckling pig), this Cajun treat’s highlight is its extras. It is dressed with cabbage and creamy Cajun sauce. The combo of tastes are wonderful. Make sure you pick up lots of napkins before you walk away with this one! 2. Crawfish Strudel from Coffee Cottage. There are many crawfish dishes on the grounds, but the the light and flaky pastry shell that makes this one my all time favorite crawfish dish in the world. It’s savory, not sweet, but they also have the white chocolate bread pudding at this booth. 3. Spinach Artichoke Casserole, Seafood Au Gratin, Sweet Potato Pone from Ten Talents Catering. This plate has veggies, a rarity in the Jazz Fest diet, plus a slightly sweet dessert. It also has the additional factor of being easy to eat while traveling between stages. 4. 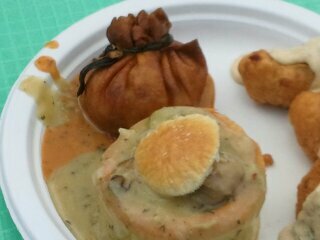 Crawfish Sack, Oyster Patty, Crawfish Beignets from Patton’s Caterers. The sacks are thin crepes filled with a wonderful crawfish etouffee, tied at the top w/ a green onion & the entire thing gets quick fried until the outside is crispy. The crawfish beignets are a non-sweet adaptation for the traditional delicacy deep fried, bite-sized crawfish bread balls served with a tasty but light remoulade sauce; fabulous. 5. Guil’s Gators from Sharon and Guilherme Wegner. If you want to try an alligator dish, my friends Sharon and Guil don’t run a restaurant anymore, but every year they make these fried alligator bits with jalapenos and onions. They are great tasting and not too spicy or gamey. Don’t forget to get seek out the Rosemint herbal iced tea or strawberry lemonade at Congo Square to wash it all down. It’s not too late! There is one more weekend of Jazz Fest, and we have a last minute availability for any 3 nights between April 30 and May 4. 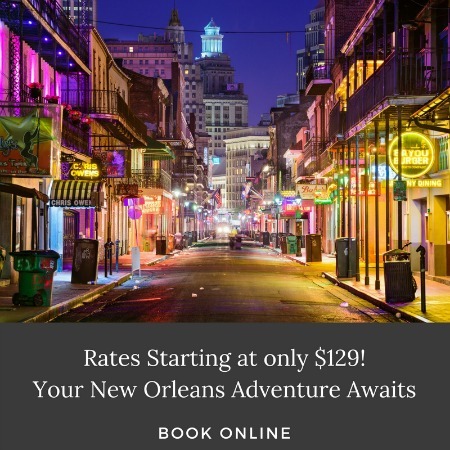 Check our reservations page for your last minute getaway to the New Orleans Jazz and Heritage Festival! This entry was posted on Tuesday, April 29th, 2014 at 9:25 am	and is filed under Festivals, New Orleans Festivals, Top 5. You can follow any responses to this entry through the RSS 2.0 feed. Both comments and pings are currently closed.